ONLY days after the European Tour announced the appointment of an unknown – in the golf world at least – Canadian called Keith Pelley as its latest chief executive, came an example of just how difficult the 51-year-old Toronto native’s job is likely to be. When the BMW PGA Championship is held next month at Wentworth, the Old World circuit’s so-called “flagship event” will be missing three of the biggest names in European golf: Henrik Stenson, Ian Poulter and Sergio Garcia. It is, at first, second and last glance, a disappointing decision by all three men. Poulter has cited his distaste for the revamped West course as the main reason for his absence from what is, for him, essentially a home game. Garcia has regularly passed on the event, using the United Kingdom’s apparently penal tax policy with regard to visiting sportsmen as his (feeble) excuse. Stenson, too, seems to have disdain for the Wentworth redesign work done under the name of former Open and US Open champion Ernie Els. If so, the big Swede is far from alone. The wholly inadequate M25 around London has more fans than the new Burma Road. Still, no matter how each of these enormously wealthy individuals feels about spending a week being endlessly pampered in a luxury hotel, they each have at least a moral duty to support and enhance the biggest event on their home tour (outside of the Open Championship). Such things are merely facts of life in golf’s upper echelons, cry the agents and the management companies. To which this column replies: “Why?” At what point in their affluent existences do the big names stop being golfers and become unfeeling businesses? When does filthy lucre, rather than the prospect of competing in a truly great event, take precedence in the decision-making process? When, in other words, does the relentless money-grab end? When is enough really enough? One week after the BMW PGA concludes, the European Tour will de-camp to Northern Ireland and, more specifically, the all-but-peerless links of Royal County Down for the Irish Open. A great field will be in attendance – including, ironically, Garcia. But why, one wonders, will some of the other prominent Europeans not be there? Because, one must conclude, they have stopped thinking like golfers. Or because they have stopped thinking at all. Or because they are listening to those with warped priorities rather than their own instincts. Whatever, this madness is damaging to the European Tour and its ongoing relationship with major sponsors. Shame on all the absentees. Speaking of Mr Pelley, while it would be unfair to fully judge George O’Grady’s successor before he even takes up his new post later this summer, it is true to say his resumé is not exactly packed with golf expertise. He plays off a “useful” five-handicap we are told. But other than that, this soon-to-be former executive with the Toronto-based conglomerate Rogers Media has little or no experience in the game that will now fill his working life. He has much to be getting on with. Not that long ago, a leading agent was heard to express something not far short of despair at the lack of forward planning within the European Tour. One had to smile, too, at the claim made by European Tour chairman David Williams: “Throughout the interview process, it was clear that Keith has an unwavering passion for golf.” Hmm… not if Pelley’s Twitter feed is anything to go by. A quick scroll through his timeline over the last year reveals not even one tweet in which the subject at hand was golf. One source in Canada also claims that the $5.2 billion 12-year rights deal brokered by Pelley between Rogers and the National Hockey League has turned out to be “unsustainable” and represented an overpayment of “about 25 per cent”. Then again, the same source also deemed Pelley to be “very, very sharp” and “a good smart man”. Another calls him “very smooth” but labels his appointment “a strange leap”. Guess we’ll just have to wait and see how far smartness and smoothness go when it comes to talking the likes of Poulter, Garcia and Stenson into something that may not, at first glance, be to their immediate financial advantage. There are exceptions, however. Just the other day, your correspondent had the pleasure of playing the Ailsa course at “Trump” Turnberry in the company of designer Martin Ebert, the man charged with tarting up the four-time Open venue. Which will happen, if the ultimate boss (the guy who thought Pinehurst No.2 was a mess at last year’s US Open because it wasn’t green enough) stays clear of the day-to-day operations. Turnberry is a beautiful and endlessly scenic place, especially in the weather Scotland has enjoyed over the past few days. But those picturesque qualities have long disguised the Ayrshire resort’s dirty little secret. Like America’s Pebble Beach, Turnberry is – or has been until now – enormously overrated as a golf course. Too many holes and features are weak (the 1st, the 4th and 11th holes), a bit silly and/or pointless (the 9th fairway and the “doughnut” bunker at the 10th) or bland (the 18th). 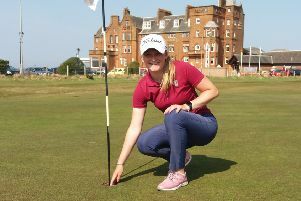 But all of the above – and a lot more – will be transformed and strengthened when work begins the day after the final round of the Ricoh Women’s British Open at the beginning of August. The highest-profile changes will come at the 9th hole. Out will go the almost unhittable fairway, replaced by a 235-yard par-3 played down the prevailing wind and towards the famous lighthouse. Even better, the next hole will become a wonderful par-5 that swings around Castle Port Bay and will include the restoration of the wonderful “jigsaw piece” bunker that pre-dated the aforementioned doughnut. Completing the run after the turn will be a new and far more interesting par-3 11th that runs much closer to the jagged shoreline. Perhaps just as impressive as the proposed changes to the Ailsa layout is the re-designed pitch-and-putt course that sits below the stately hotel. Great fun before, it looks even more exciting now. If only we could say the same of all the other stuff forced on our best courses over the past decade or so. All because the modern ball goes way too far when struck by frying pan drivers wielded by the game’s best players. Oh well.